Make a tight dough with wheat flour & water. Mix grated radish,salt,g.chilles & cilantro. Squeeze the excess water from the radish mixture. Make a ball & flatten the dough. In centre put radish mixture & again fold it and flatten it again. Heat tawa, add stuffed paratha, cook bothsides evenly. Serve hot with veg Masala or Chutneys. 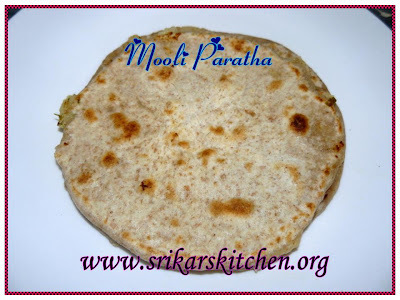 Delicious stuffed paratha looks yummy!healthy too..
Never tasted it..Looks yum sri..
Wow nice paratha.I love mooli paratha. Paratha looks fluffy & soft. I like ur step by step clicks. i have done once...its healthy and looks great..
U know the trick of tempting dont you? ;) woooo look at those mooli stuffed parathas, too good to resist! 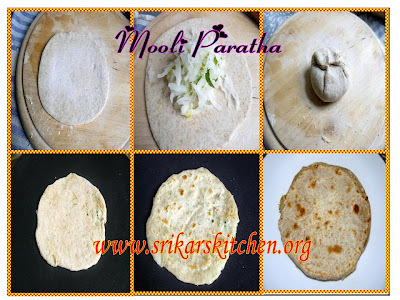 methodical preparation snaps are very clear sri :)damn neat.I too made two varieties of parathas will post it soon. The mooli paratha looks inviting and yum...its been a long time since I made this and your picture is tempting me to make this soon! Radish stuffed delicious paratha. Looks yummy. Good one. Yummy parathas. Loved the snaps! My favorite paratha! looks perfect,dear! One of my fav parathas! Yummy with curd and ketchup! nice recipe and the picture looks great...as usual. Btn you look pretty with ur kid!! !